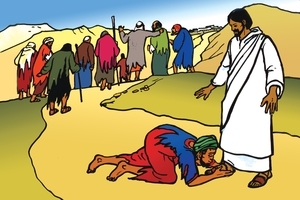 Outline: Stories of healing of the blind man and the 10 lepers. Christ's death, resurrection and ascension. Christ's invitation. Sinner's prayer. When Jesus Christ was on earth, He did many wonderful things. When people were ill, He healed them. He told the people about heaven and about God. One day there was a blind man sitting by the roadside begging. (pause 3 sec. *) He knew that he could never be cured of his blindness. Only God could heal such a person. Suddenly he heard a crowd of people approaching and someone shouted, "Jesus is coming by!" Now this blind man had heard about the wonderful things that Jesus did, and he believed that Jesus was truly the Son of God; for only God could do such great works. When the crowd came near, the blind man called out. "Jesus, Jesus! Have mercy on me!" Then Jesus stretched out His hand and healed him. After that he could see everything. He loved Jesus and followed Him. At another time some lepers were calling, "Unclean! Unclean! Keep away!" Lepers were people with a disease which could never be cured. They were full of sores. When Jesus saw them He felt sorry for them and healed them. They were so happy then to be well and strong again that they went away running to their homes. But they forgot to say "thank you" to Jesus. Only one of them remembered to return and say, "Thank you." When he worshipped Jesus and thanked Him, Jesus healed the sin in his heart. After Jesus had lived on earth for 33 years, cruel men took Him. They hung Him on a cross. There He bled and died. He was God's Son but He was willing to suffer and die for us so that we could be saved and go to heaven. After three days He came back to life. And 40 days later He went back to His Father in heaven. There He is now, watching over us. He does not want us to die for our sins, and go to the place of punishment. He says, "Call upon Me and I will forgive all your sins and make you a new person." How do we call upon Jesus? We speak to Him with words like these: "Dear God, I am a sinner. But I am very much grieved because of my sins. I do not want to do wrong any more. Please take away my sins and make my heart good. This I ask in Jesus' name. Amen." When we talk to Jesus sincerely, Jesus takes away our sin. Sin is like a disease which is eating inside of us. If we invite Jesus to be our Master then He will heal the disease inside of us. He makes our hearts good and gives us strength to follow Him in His good way. Say to Jesus, "Thank you for saving me. Thank you for healing my soul." Then be sure to tell others what Jesus has done for you. GRN has recorded a version of this script in 267 languages and dialects. See full list. See different versions of this script in French.